One company dominates this month’s edition of the ‘Cruise Issue’ and that is AmaWaterways, which takes the first three places in the third publication of the Douglas Ward/Berlitz River Cruising in Europe & the USA, out now. (See also ON TOUR: Paris to Paris on the Seine in this issue and the story of the D-Day landings). In 2019, the new AmaMagna could easily take top honours, the first modern double-width European river cruise ship. More anon. In some respects the river cruise book is totally different from Ward’s Cruising and Cruise Ships (meaning deep sea ships). For most people, the major feature is the actual ship comparisons, comments and ratings. Around 350 from 70 companies. Whether every ship in a class should feature separately is a moot point. With many, the changes are minor and the words are the same. Perhaps for the 2019 34th edition, typically the Grand Princess class, might make for one entry. In any event, 174 of the 736 pages are taken up with a fine overview to cruising, a section one suspects most regular cruisers who take the book will not bother with. They are interested in the ship descriptions. 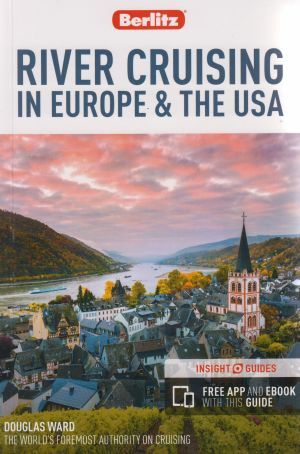 With River Cruising in Europe & the USA, the introduction is 115 of 278 pages. There are another 30 pages devoted to North America. It is an excellent production. The main overview is most interesting for everyone, with 50 pages devoted to descriptions and diagrams of the European waterways, and 20 operators briefly sketched. Cuisine has a small section devoted to eating and four pages are taken up outlining what is termed “accommodation”, in other words the cabins/suites. Barge cruising is discussed in a short chapter. Ward again fails to mention the very popular Russian cruises from St Petersburg to Moscow and vice-versa. Even when it was the USSR, Russia played in the European football championships. He has added American Queen, alongside some other US ships, but that classic showboat-style Mississippi paddle steamer is the only North American vessel to gain a 4-star rating, just. AmaWaterways was founded in 2002 with US-based but Vienna-born Rudi Schreiner as president, a position he continues to hold in what is still very much a family business. For 2019, AmaWaterways will operate 22 ships in Europe, Southeast Asia and Africa. Already the talking point for the river cruise industry, AmaMagna will next year undoubtedly set new standards and perhaps even open up fresh markets. Limited to the Danube river, she debuts in May 2019. At nearly twice the width of traditional European river ships, AmaMagna is a revolutionary new vessel offering a watersports platform, choice of four restaurants, wellness studio and the largest general accommodation yet seen on a river ship. Some 196 guests will be looked after by 70 crew. For 2019, her only true competitor is Crystal Mozart, a much older vessel remodelled when coming into service last year. AmaMagna will offer the most spacious and comfortable accommodation on the Danube, with 53 suites ranging from 355sq ft to a double size luxurious 710sq ft. All will offer full-width step-out balconies. Each one will include a sizeable marble bathroom, many boasting double sinks, as well as a deluxe walk-in multi-jet shower and separate bath. There are an additional 34 staterooms at 252sq ft with full balcony and 11 staterooms at 205sq ft with large fixed windows. Fine dining will be offered in all the restaurants at no additional charge, with complimentary wine, beer and soft drinks also served at meal times. With AmaMagna, ‘The Chef’s Table’ has been retained where guests can watch a multi-course taster menu being prepared. Two more restaurants are added. ‘Al Fresco’ will accommodate up to 35 diners. Located at the front of the ship and with retractable windows, the restaurant is expected to be a sought-after dining option, whatever the weather. ‘Jimmy’s Wine Bar Restaurant’ has been named after the late Jimmy Murphy, one of AmaWaterways’ co-founders. Wine connoisseurs will revel in the ambiance of this unique space, where 65 guests can indulge in delicious cuisine paired with complimentary fine wines at high-top tables and in private wine rooms. 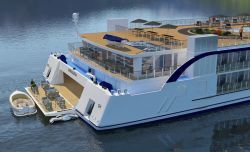 AmaMagna will be the first river-cruise ship to feature a watersports platform, complete with a Sundowner vessel offering a range of unique activity and excursion opportunities. There is no extra cost to get that little bit closer to the Danube. AmaWaterways recently introduced Wellness hosts on to several of its ships and was the first company to offer a fleet of bicycles for use by guests. AmaMagna continues this theme with a large space allocated to health and well-being. The ‘Zen Wellness studio’ is a new multi-functional Health & Wellness Studio complete with juice bar and retractable windows, where guests will have the opportunity to participate in group classes focussed on stretching, cardio and circuit training. Again, it is part of the total package. More space has also been made available for salon services. AmaMagna will offer two massage rooms and as well as hair styling (currently offered on AmaWaterways’ other ships), guests can treat themselves to a range of additional beauty treatments such as manicures and pedicures. On the top deck there is both a swimming pool and whirlpool. AmaMagna will sail next summer on seven-night rotations along the Danube from Vilshofen, near Passau, to Budapest.